• AK11 is an excellent product for Smart City Solution. It is capable of retrieving vast amount of vehicle data and send the information back to server through various communication technology for data analysis in order to conduct fleet management. Using these information we are able to prevent fatigue driving, maintain vehicle condition, and maximize its efficiency. • The AK11 supports 4G communication with the capability of falling back to 3G and 2G in order to fit for the network in different regions. • To ensure the product quality and stability, AK11 has been certified and approved by FCC, PTCRB, and AT&T. • The main target market will be the System Integrators in North America region. In the region, the AK11 will be able to enhance fleet's driver safety and operational efficiency. • This model has already been well recognized by the market with great potentials. AK11 is not only a multifunctional hardwired unit, but also a plug & play device and it includes diverse advanced features. 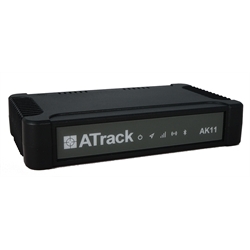 AK11 is a versatile 4G device suitable for real-time management of both small and large fleets across various market verticals. AK11 is a single model that combines all.